How the guests feel about the tea ceremony experience in the Koto tea house? What they liked and how this event contributed for their stay during Kyoto. We asked two couples from Europe about their experience and feelings towards the way of tea. First time in Kyoto Japan, experience tea ceremony . For Monika and Zoli traveling to Japan was a dream from a long time ago. This was their first time in Japan, therefore their schedule was really busy to see many places in Tokyo, Osaka, Nara, and Kyoto. So they spent only one and a half day in Kyoto, but they think the tea ceremony experience at Koto was worth their time. ‘Of course I was worrying If I am doing the movements right, but Rie san was really kind and I didn’t felt embarrassed at all’ – said Monika. Before the tea ceremony she was happy to change in to kimono on the 2nd floor of Koto teahouse. She had the opportunity to choose from many colors and designs and get changed with the help of the tea master, Rie san. Because it was on the first days of January, they had the chance to participate in a New Year style tea ceremony, where the tea master was wearing a special kimono, dedicated for the New Year. 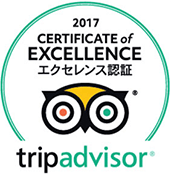 Overall they enjoyed this relaxing and authentic experience, and they felt refreshed to continue their journey across Japan. Second time in Kyoto, first tea ceremony experience! 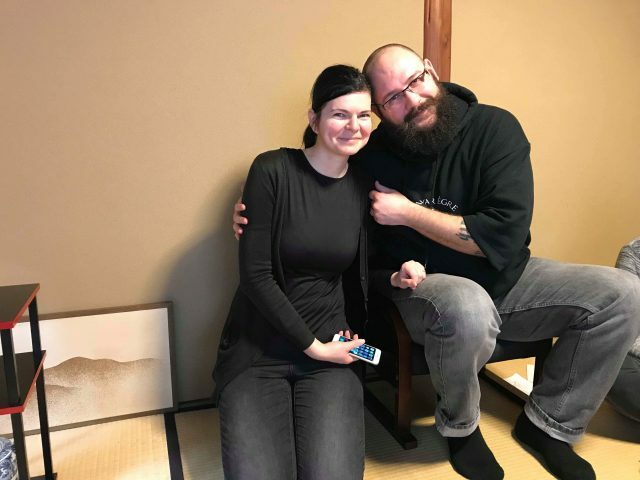 The other couple, Niki and Balint visited Japan and Kyoto for the second time. First time – at cherry blossom season – they enjoyed it so much, so they came back and spent their New Year holiday in Osaka and Kyoto. ‘We felt like the tea ceremony is the gateway to an ancient, sacred world where everything has a particular meaning.’ – said Niki. They enjoyed the peaceful atmosphere and the structured way of the event, that every movement had its own order and meaning. In our everyday life we are in a hurry, we do many things at the same time, our mind is scattered, but during the tea ceremony we live in the moment: to calm down, to be present, to feel the harmony and share peacefulness with others. The tea master communicates and acts in a certain manner which supported the participants immersion in the ceremony. They didn’t know what to expect, but they became very motivated and interested after the session. 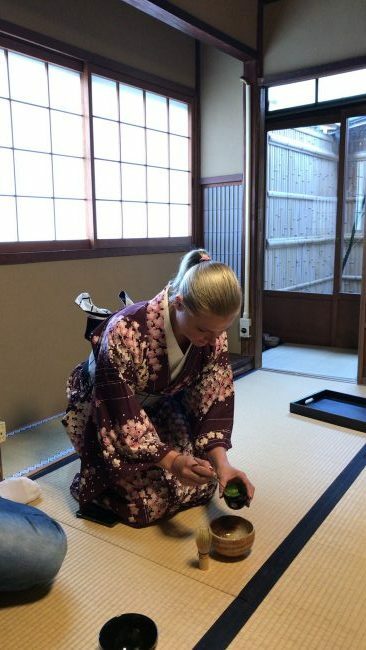 Despite the fact that Niki doesn’t like the flavour of matcha so much, she still enjoyed the mentality and principles of the way of the tea. 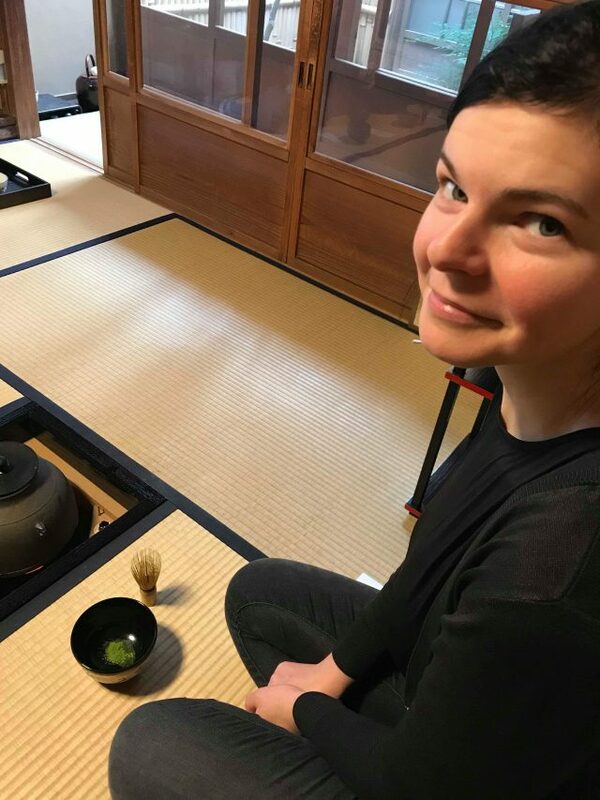 But Balint became so interested, that they went to the flea market of Toji temple on the next Sunday and bought chawan (tea cup), chasen (bamboo whisk) to bring home to their country. They learnt from Rie san, that many chawan has a ‘face’ with a particular meaning, so they payed attention to that when they selected their own. The couple also went to a tea shop and bought matcha from Uji, which is one of the best areas of Japan in terms of the quality of the tea. So now they can drink matcha at home too. 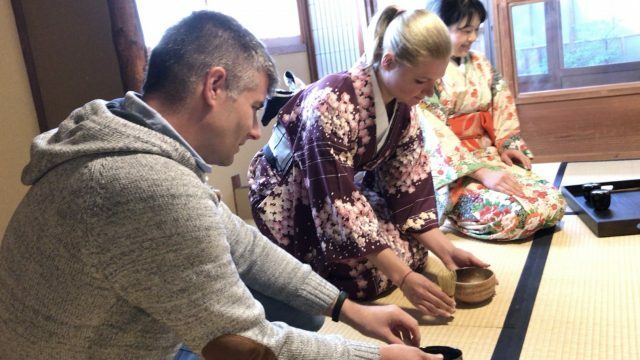 A tea ceremony experience is only 45 minutes, but it can lead to deepen your understanding about Japanese culture, and it seems it can enrich your lifestyle too. If you became interested, you can register for a tea ceremony experience right here.